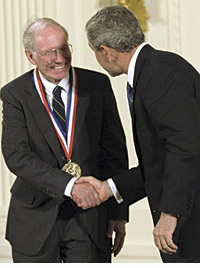 W. Jason Morgan receives the National Medal of Science from President Bush, in honor of his discoveries underlying modern studies of earthquakes and volcanoes. Princeton University geophysicist W. Jason Morgan was awarded the National Medal of Science, the nation's highest scientific honor, for theories that describe how land masses move, volcanoes arise and many other features of the land and sea take shape. Morgan, the Knox Taylor Professor of Geography, was among eight scientists and engineers presented with the award by President Bush at the White House on Thursday, Nov. 6. The award recognizes Morgan for his work pioneering two fundamental ideas -- plate tectonics and mantle plumes. The first describes how the Earth's surface consists of a dozen plates that move with respect to each other. The second explains how heat within the Earth forces columns of solid, but ductile material through the Earth's mantle creating "hot spots" at the surface. "The theory of plate tectonics he published in 1968 is one of the major milestones of U.S. science in the 20th century," said Anthony Dahlen, chair of the Princeton Department of Geosciences. "I am thrilled to see Jason Morgan honored so appropriately," said President Shirley M. Tilghman. "He is not only a remarkable scientist, but a skilled and enthusiastic teacher. He has mentored generations of students, often taking them into the field to experience first-hand the power of science to explain the most basic workings of our planet." More information is available in the Weekly Bulletin.